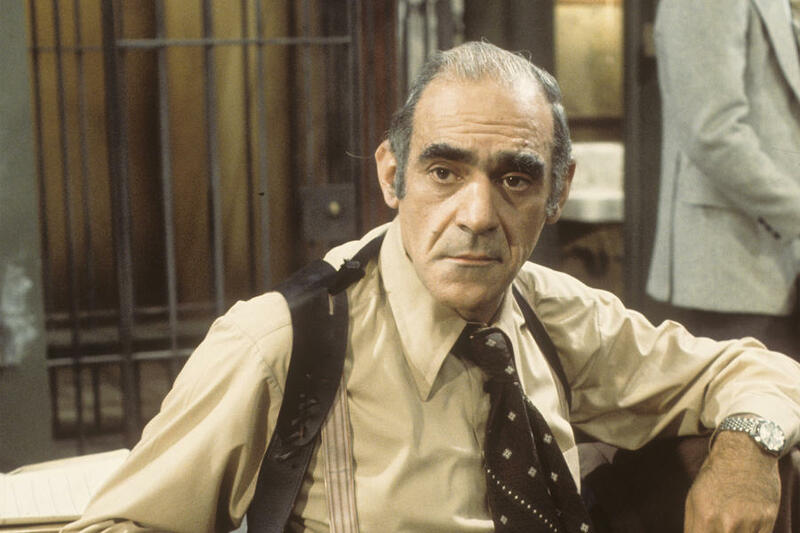 Abe Vigoda in his most well-known role as Phil Fish in "Barney Miller"
He went by one simple name that seemed to say so much: “Fish”. Starting out as a New York City police detective in “Barney Miller”, he grew popular enough he would eventually get his own show, if ever so briefly. Fish was played by Abe Vigoda, and I was sad to hear that he passed away last year, yet it brought back memories of “Barney Miller”, “Fish”, and everything else he did as an actor. Vigoda was best known in his early work for his role as Sal Tessio in “The Godfather”. He played a trusted friend of Vito Corleone who ultimately meets his demise after betraying the family. That role caught the attention of Danny Arnold and Ted Flicker who were casting for a new comedy set primarily in New York Police Department squad room called “Barney Miller”. His audition landed him the role of Phil Fish, which would bring him into living rooms across the world. He was the elder statesman in a squad room full of mostly male detectives. With his age, he brought an experience and compassion that underlied his police work. He seemed to bring that same experience and compassion to his acting. Fish was older, nearing retirement, and acted as a mentor to other detectives. He also seemed to be battling nagging health issues, most notably hemorrhoids. My outstanding memory of Abe Vigoda was how the squad room could be going crazy, yet he had this look that said much more than any words could. He just looked so tired, with dead sunken and eyes – the epitome of being beleaguered. It was the perfect look for deadpan comedy. Fish also seemed to be on the phone regularly with his wife Bernice. We would all get to meet Bernice as, after two seasons on “Barney Miller”, Phil Fish got his own show, fittingly and simply called, “Fish”. It took viewers into Phil and Bernice’s home life, where they took in five racially-mixed foster children including Loomis, played by a young Todd Bridges who would go on to fame as Willis Jackson in “Diff’rent Strokes”. Again, Fish had that same look as all the chaos swirled around him. After two years and 35 episodes, “Fish” was cancelled. He would make a guest appearance on “Barney Miller”, in 1982, visiting the squad room as a now retired detective, and that would be the last we saw of Phil Fish. His final film role would be in “Sweet Destiny” in 2014. He died Jan. 26, 2016 at the age of 94. “Barney Miller” was one of the best sitcoms of the 1980s, with several memorable characters. Yet it was Phil Fish who proved to be the only one popular enough to be spun off into his own series. It showed how enduring and endearing the character and the actor who played him were. Fish was unique. He was an old, tired looking police detective who was caring, sensitive and supportive at the same time. He even looked a little bit like a fish. It was quite a character to portray. Abe Vigoda’s legacy is bringing him to all of us.